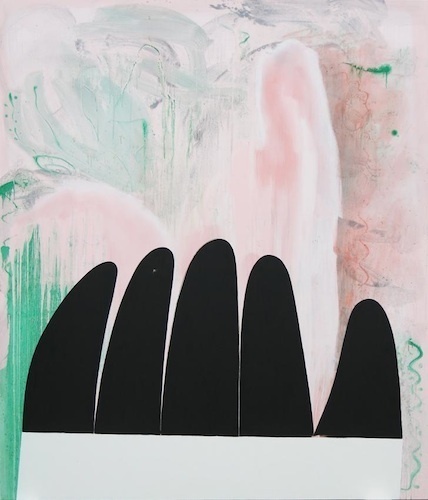 Charline von Heyl, Night Doctor, 2013, oil and acrylic on canvas, 82 1/2 x 68". One may say a successful painting forces the viewer to keep looking, beset with an urge to understand some elusive trait that leaves an impression so fleeting that desire is set off again and again. This paradoxical quality is the crux of Charline von Heyl’s latest exhibition, which presents fourteen large-scale paintings created in the past year. Each is simultaneously form-driven and formless, leaving one with both a strong afterimage and a shifting after-impression. The result is a suite of works that is unfriendly to its beholder, provoking the impulse to look further while refusing to stay within the mind. Night Doctor, 2013, may be the consummate example. Five matte black graphic shapes, almost like fingers, could not be more memorable—the afterimage burns the retina. In contrast, the pink background, composed of candy-colored swaths and haphazard mint-green drips and scribbles, recedes into an abyss. The result is a sort of visual amnesia; the painting evaporates from the mind like hot breath from a cold window. Skull, 2012, functions similarly but is much more centripedal, a mass of bruise-colored brushstrokes circling languidly around a lone eye socket. Outside the skull is a plain background so devoid of the energy vibrating inside that it seems akin to a blob of mercury on a petri dish, surface tension bubbling convexly, metallic and writhing. The form is active, the formlessness passive, leaving, as von Heyl once said, “a hole in the mind, a longing,” perhaps to keep memory alive.